Everyone enjoys pizza made the way they like. 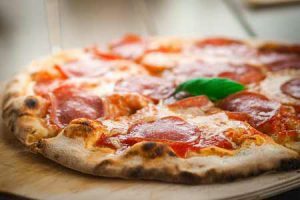 Whether you're watching the big game, you're out on the town, or you're just craving a slice of delicious pizza pie, there are plenty of places to find a tasty slice of pizza in Big Sky. If you're new to Big Sky, you're not going to find any of your standard, boring, and easily identifiable pizza chains that most ski towns have. The pizza joints in Big Sky are totally homegrown and they certainly make excellent pizzas that we know your tastebuds are really going to enjoy. Ousel & Spur Pizza Company - 406-995-7175 - Conveniently located in Big Sky Town Center right next door to the Lone Peak Cinema, Ousel & Spur is the ideal place to order a pizza before a movie or enjoy live music. Blue Moon Bakery - 406-995-2305 - Big Sky's classic pizzeria is situated in Westfork Meadows. Stop by and enjoy the laid back atmosphere and tasty creations. Milkie's Pizza & Pub - 406-995-2900 - If you're looking for good pizza by the slice or by the pie, order in or carry out from Milkies in the Westfork Meadows. 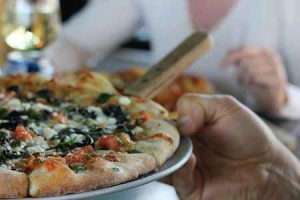 Pizza Works via the Andiamos Italian Grille - 406-995-8047 - Andiamos is located in the Big Sky Mountain Village Plaza. Primarily they are a top-notch Italian restaurant, but they also deliver pizzas during the lunch hour and to select properties. Every place that serves pizza in Big Sky can create your standard cheese and pepperoni pizza or a hawaiian style pie, but we highly encourage you to get adventurous and try a few toppings that are uniquely Big Sky. Try the Gaper Supreme, the Montanan, or the Milkie. Stop back by and let us know what pizza in Big Sky is your favorite! FYI - If you're the odd one out in your crew and you don't really enjoy pizza, most of these restaurants have other menu items that will appeal to you. Now go and order a pizza in Big Sky. You deserve it.